For decades Viktor Astafiev is a national classic prose writer, whose most significant works are studied at school. Every Russian and every foreigner, if they are really concerned with the problems on the Russian national agenda will find Astafievs books most helpful. In Russia its traditional to treat great writers as influential teachers of life. As for Astafiev, such is his attitude to the Russian writers of genius Gogol, Turgenev, Lev Tolstoy. Yet, he does not rank himself among the great. Nor does he regard himself as an instructor in major issues of life. More than that, he looks upon himself with a good share of humor. I knew how to live, I would sell my old piano and some other things, buy a helicopter, typewrite leaflets with instructions as to how to live and drop them from the sky. But I don know how says the writer. That helicopter of his would have to cover large distances, because the land where Astafiev lives, East Siberia, is measured not by the hundreds but by the thousands of kilometers. For a larger part of the year Astafiev lives in the settlement of Ovsyanka on the Yenisey River, where several generations of his ancestors have worked the land. Astafiev also has an apartment in Krasnoyarsk, a city that is at least 4 hours flight from Moscow. A native Siberian, he is a rare guest in Moscow: the noisy and busy life of a big city is not to his liking. In the evening I like to go out to the Yenisei and sit for a while on a log. This makes me feel stronger. In my vegetable garden I have onions, salad, strawberries. I plant everything and reap the harvest myself. I have also a few trees I brought from the taiga mountain ashes, larches and cedars. One cedar already bears nuts. Perhaps this is the greatest joy in my life after the joy of creation. Astafiev does not imagine human existence without reading books. Thanks to him the settlement of Ovsyanka has a wonderful new library. On the shelves there are volumes of writers Astafiev devoured as a boy and a young man: the Americans Mark Twain and Fenimor Cooper, the French Victor Hugo and Jules Verne. Astafiev says: "I read Cervantes Don Quixote not as a young man but much later. This is the book of books, the most merciful book and its main character is the most merciful man. There was a period when I read a lot of Shishkov and Gorky. Then I passed over to Dostoevsky and only at 45 discovered books by Ivan Bunin, who was not available in the Siberian province. And my love for Turgenevs novel Rudin caused me some trouble. During World War Two I served in the communications troops. I spent my every spare minute on my favorite book and used to quote for my comrades my favorite excerpts about the life of the Russian gentry in the mid-19th century and about Rudins philosophic strivings. But my comrades thought all this was absolutely out of place and wouldn't listen to me. 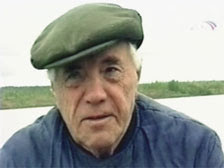 One of the main characters of Astafiev's prose is the nature of Siberia. The pages devoted to nature are so vivid that the reader can immediately imagine the amazing spots which only a few have managed to see with their own eyes. Astafiev has described the powerful Yenisey, and smaller rivers such as the Nizhnyaya Tunguska and Oparikha, each with its own character. The novel The Czar-Fish was immediately recognized as a literary masterpiece but it also came under criticism. Astafiev spangled the 550 pages of the book with rare dialect words and expressions. A native Russian-speaker would find this book difficult even to read. But this did not stop translators and publishers and Astafievs books have been translated into German, English, Bulgarian, Japanese, Korean, French and many other languages. His reaction to the criticism was the following: Nowadays many people feel embarrassed having to admit their ignorance of foreign languages. Is it not embarrassing not to know a language spoken by the one million of Siberians? And how amazing are these words, how precise! The rich Russian language, which has absorbed various dialects, the traditional way of life and customs all go to create what is called the national character. Astafiev books reveal what he thinks of the national character and the Russian national idea. In 1995 he published the novel The Condemned and the Killed, another book about World War Two, probably, the most cruel of all. He tried to tell the whole truth, however bitter and unbearable it might be. Death, horror, the madness of war are all described without reservations. Astafiev, who has been in action himself, has repeatedly addressed the subject of war, trying to say what he knows about the past so that this past would never repeat. He has the courage to take a glimpse of the enemy trenches, show the hardships of war experienced not only by Russian but also by German soldiers. The Condemned and the Killed is perhaps the first of all Russian novels about the war that ends with words of compassion for the tragic fate of the German invaders. Shepherd and a Shepherdess and The Merry Soldier are also books about war. But now Astafiev does not want to address the subject again, saying he has neither energy nor health, and, most important, the strength of spirit for this. These books are so hard to write. Hundreds of documents about World War Two have passed through his hands, documents that became available only recently. These documents shocked the writer, made him take a different view of many historical events. He arrived at the conclusion that Leningrad ought to have been surrendered in 1942, and that the storming of Berlin was a mistake of the command. He admits that his relationships with the world and himself have become more complex as he has grown old. Once he thought it was the greatest happiness to survive in the war. Then his concerns were for his children and grandchildren. As for happiness, Astafiev thinks it is not a constant phenomenon. As a person becomes morally purer, his demands for happiness also grow. The Krasnoyarsk publishing house Ofset has released a 15-volume collection of Astafievs work. Now he intends to write a novel for children, as he puts it, just to humor himself. Meanwhile he writes on social-political subjects and also short stories. The writer has visited many countries, including Germany, Switzerland, and Bulgaria and the great cities of the world. He was fascinated with the Colombian capital Bogota, with its nature that produces four harvests a year, where in December, when severe frosts reign in Siberia, eucalyptuses break out blossoming. But in his heart he has always been concerned with his native land. His greatest aspiration is to see a wide staircase of Siberian larch built in his native village, which would run from the church in the center of the village down to the Yenisey River .